You can use your Mac’s Terminal to download files, test your internet speed, convert images, or even listen to Pandora. All this and more is just a couple of homebrew installations away. We’ve shown you a bunch of terminal tricks in macOS, all based on software that comes with the operating system itself. But you can do even more with the right free software, and thankfully, there’s a great package manager called Homebrew that lets you install loads of useful command line utilities. Check out our guide to installing Homebrew, if you haven’t already, then come back here to check out some of the best tools it offers. We’re really just scratching the surface here, but if you type wget --help you’ll learn a lot more. You can run the test by typing speedtest-cli or speedtest_cli in the Terminal. You’ll get the same results as the web version, just with a lot less visual clutter. Get a weather forecast from the Terminal? Why not! Again, it’s easy to install. -l lets me set the location, and Hillsboro,OR is where I live. -u lets me set which units to use, and I opted for imperial because I live in the USA and that’s how they do things here. You can read more details on the ansiweather GitHub page, if you’re interested. This application probably isn’t one you’ll use every day, but could be awesome if you’ve set up GeekTool to customize your desktop. Launch calc and you can start typing equations, as shown in the screenshot. If you need some help learning what characters to use, just type help intro and read the resulting tutorial. The program is quite powerful once you learn it, so dive in. We’ve shown you ways to customize your dock, but dockutil goes just a little bit further, and is quick to install. --add tells the program to add an icon. The URL following this tells the program which website I’d like to point to; you can also point to applications or folders. --label lets me name the dock icon, which I’ve opted to call Facebook. Just like that, you’ll see a Dock icon for launching Facebook. You can also add applications, folders, and blank spaces. For information on all this and more, check out the dockutil page on Github. There’s a lot of power to unpack here, so feel free to dive in–check out our original guide for tons of useful info. 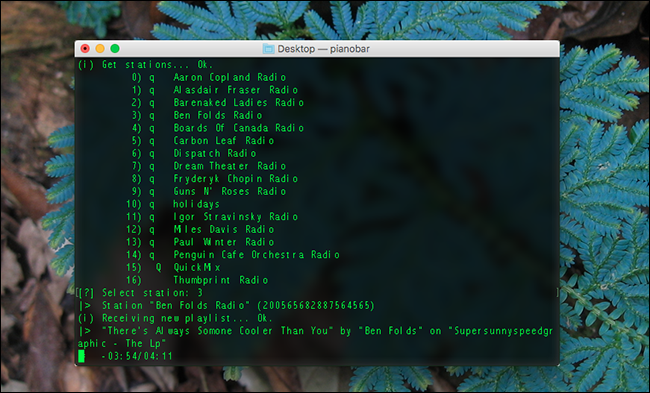 Using the terminal to listen to music may seem like a gimmick, but it’s actually awesome. Pianobar streams Pandora to your computer with great keyboard shortcuts, without the big Flash-y site, and without commercials. Again, you can install with one command. Launch pianobar and you’ll be asked for your Pandora account info, then you’re ready to rock. You can pick from among your stations using numbers, and keyboard shortcuts let you do things like skip tracks and love songs. Press “?” to see a full list of shortcuts. Once installed, you can toggle your menu bar between dark mode and light mode with a simple command: dark-mode. Run that, and your menu bar will switch color schemes. It’s a quick thing, sure, but someone with some scripting experience could put it to good use. For some reason, no roundup of command prompt tools for beginners is complete without mention of cowsay. Type cowsay, followed by any sentence, and an ascii cow will say it back to you. Magical. Installing, once again, is easy with Homebrew. You know what? That’s actually a fairly decent tutorial for learning the command line. No wonder every list like this seems to include this otherwise useless tool. Enjoy!